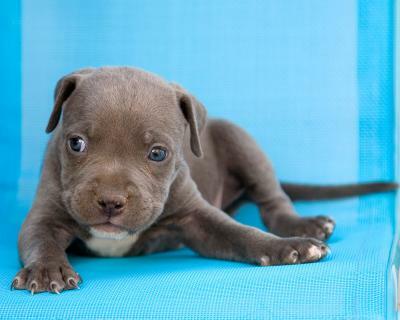 Blue pit bull puppies are among the most sought-after coat color variations of the American Pit Bull Terrier. If you are considering adopting a blue pit bull, it is important to find a reputable breeder and to understand the breed. 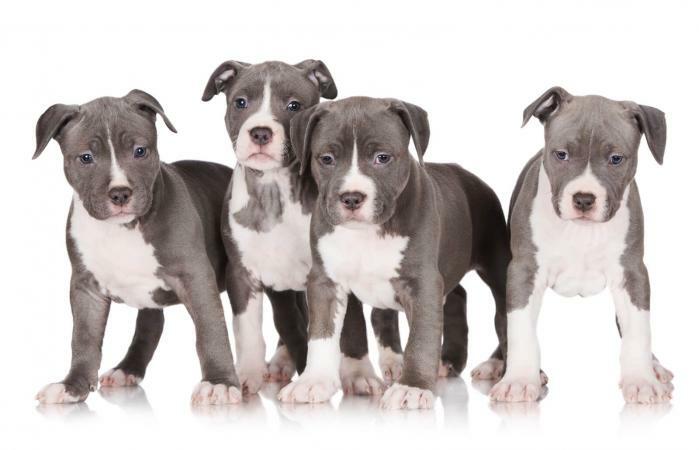 Learn about blue pit bulls and what to look for in a puppy and a breeder. Blue pit bulls and blue-nose pit bulls are American Pit Bull Terriers with blue coats or blue noses. They are not a separate breed or specific bloodline. Blue Pit puppies range in color from silver blue and gray to deep charcoal. The blue color is a recessive trait, and both parents must carry this recessive gene for blue in order for one or more puppies in a litter to inherit it. Due to the fact that blue coats and noses are the results of a recessive trait, breeders who specialize in producing blue pit bulls have to be careful not to over-breed the same dogs since they are working with small gene pools. Unfortunately, over-breeding does occur in some blue pit bulls and can result in behavioral and health problems. When you consider dog adoption, be careful to find a breeder who follows ethical breeding practices. Blue Pit Bull Terrier or Blue American Staffordshire Terrier? There is some confusion over whether pit bulls should be called American Staffordshire Terriers or American Pitbull Terriers. The American Kennel Club (AKC) technically does not recognize the American Pit Bull Terrier (APBTs) as a breed, but it does recognize American Staffordshire terriers (Amstaffs) as an official breed. On the other hand, the United Kennel Club (UKC) recognizes these dogs as two separate breeds. To add to the confusion, some dogs recognized as Amstaffs with the AKC are considered APBTs by the UKC. Are Blue Pit Bulls Real Pit Bulls? The issue of blue pit bulls is also confusing. Some pit bull experts argue that blue pit bulls are not even true American Pit Bull Terriers. Well-known author, trainer, and breed expert Diane Jessup claims that the blue color is only possible in Amstaffs. However, the UKC breed standard for the American Pit Bull Terrier allows for any color, including blue. 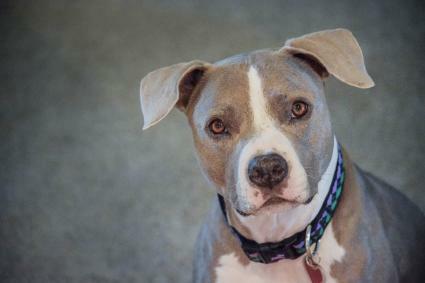 In addition, the American Dog Owners Association (ADBA), which also recognizes the American Pit Bull Terrier as a breed, allows for blue coloring as well. Since the APBT and AmStaff both began as the same breed it follows that the blue color is available in both. American Pit Bull Terriers, including blue pit bulls, are muscular, solidly built dogs. 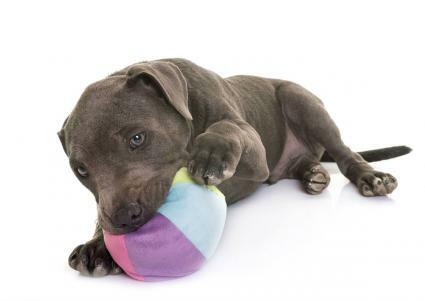 Understanding the following characteristics can help you pick out a blue pit bull puppy. Weight: An adult male weighs between 35 and 60 pounds. An adult female weights between 30 and 50 pounds. Height: These dogs reach between 18 and 22 inches in height. Head: The head is large with a flat or slightly rounded skull and prominent muscular cheeks that are usually free of wrinkles. Wrinkles may form around the forehead when the dog is concentrating. Muzzle: The broad muzzle is shorter than the skull. Teeth: The teeth are set in a scissors bite. Nose: The nose is large with wide nostrils. Nose colors are most commonly black, but they can be other colors, such as red or blue. Eyes: Round eyes are medium-sized and sit low on the skull. The eyes range in color and any color is acceptable. However, the UKC considers blue eyes a fault. Ears: The ears are set high on the skull and can be cropped or natural. Neck: The neck is broad and muscular. Body: The body is generally muscular with broad shoulders and a deep chest. Coat: The coat is stiff, shiny and short. The coat comes in colors ranging from tan and white to blue and black. 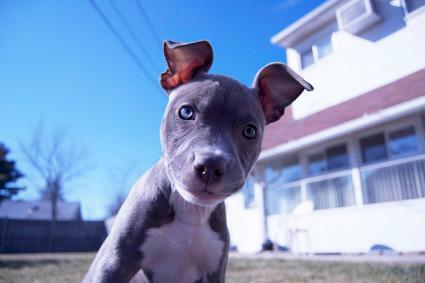 Blue pit bull pups are loyal, energetic, affectionate and brave. Pit bulls can have a tendency to be aggressive to other dogs and early socialization and training is a must. Some pit bull owners refer to the dogs as stubborn but with the right positive reinforcement training and socialization, these puppies can become excellent family pets. They are also very intelligent dogs that enjoy people so you can train them to do many fun things such as tricks, dog sports, and even therapy dog work. The blue nose pit bull life span is approximately 12 to 14 years. Do I have time to train this puppy? All dogs can benefit from socialization and training, but it is especially important for pit bulls. Blue pit bull puppies require early and constant socialization and may require additional training during their lifetime to manage issues such as dog-to-dog aggression. You need to make time for puppy training classes and follow the professional trainer's advice for the best results. Does my lifestyle work for a pit bull? Pit bull pups and adults are full of energy and thrive on exercise. Sufficient exercise can help to prevent some behavioral problems. Leisurely walks may not be enough exercise for some dogs. A fenced-in yard is perfect for the dog to run around in and get daily exercise in addition to walks. This is not the best dog for an apartment dweller or someone without a fenced-in yard. Are my children mature enough to handle this puppy once it becomes an adult? Generally, pit bulls are not recommended for families with young children for both the dog's sake and the children's. Young children may be unintentionally hurt by playing with the dog due to his strength and energy level. However, a properly trained pit bull may do well. Consult a professional trainer for advice if you are considering adopting a pit bull and have young children. Always supervise young children with pit bulls or any dog. Are pit bulls allowed in my area? Unfortunately, some locations ban pit bulls. Check local laws and housing rules to make sure pit bulls are allowed in your area before you bring a puppy home. To get a healthy and well-behaved purebred blue pit bull puppy, you should adopt a dog from a reputable breeder. Reputable breeders of full blooded blue pit bulls should fit the following description. Most importantly, seek out a breeder who breeds above all for a good temperament and health first and color second. Dogs bred for a physical characteristic only, or primarily, will most likely produce dogs with poor temperaments and health. Because the blue color is a recessive trait, you should expect to see puppies with other colors in the litter. How Much Does a Blue Nose Pit Bull Cost? Pricing for a blue pit bull puppy will vary widely by the breeder but you can expect them to cost more than other "typical" colors of APBTs and AmStaffs. Don't be surprised to see prices for blue pit bull puppies in the $1,000 to $3,000 range. Pit bull puppies in other colors can start at around $250 up to $3,000 or more. The price to adopt a blue pit bull puppy ranges around $200 with adults being the same or less depending on the rescue group's policies. Blue pit bulls, as well as any color pit bull, are wonderful, loving companions with the right person willing to train and socialize their new puppy. When looking for a blue pit bull puppy, make sure you do your research, are sure this is the right breed for you and do your due diligence finding a reputable breeder or rescue to find your new best friend.